A number of high-profile incidents in the Premier League has brought the issue of diving to the forefront again. And Clarets boss Sean Dyche admits his players have been punished for trying to be honest. On Saturday, Hull City's Robert Snodgrass, already on a yellow card, went over under no contact from Crystal Palace's Scott Dann to win a penalty which he converted. And the previous week, Spurs' Dele Alli also simulated contact from Swansea's Kyle Naughton, earning a spot kick which Harry Kane scored. After that game, Tottenham boss Mauricio Pocchetino admitted: “Now, we have the influence of the Latin people that try to cheat, always. “Maybe, you were more pure 20, 25, 30 years ago. Now you are like us!" Asked if players practiced the dark art, he added: "In Argentina, yes,. “The people sometimes practise that. It’s true. But many years ago. Now, I don’t know. But when I was a player, it was part of training to try to cheat." 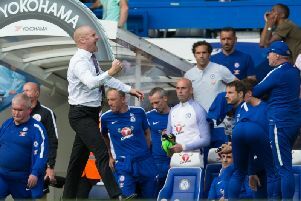 Simulation, exaggeration, or downright cheating, Dyche won't stand for it from his players, despite it potentially costing them vital Premier League points. "They get frustrated, we do everything right and we get nothing. They do it because they’re frustrated, but I said ‘that’s not us lads’. If other people want to do it, that’s for them. It’s not what we do. "It’s cost us points already because I refuse to condone it. We’ve not had the decisions. Michael Keane first game of the season, a pull on the shirt in the box and he tries to stay and win the ball and we get nothing. If he goes down it’s a probable penalty. "Jeff Hendrick on Saturday gets smashed in the back and we get nothing. We all know what happened on other pitches on Saturday in the country." Dyche can't understand why the powers that be allow diving to taint a world-renowned product: "It’s ridiculous. I just can’t see it from a moral point of view, from a brand point of view, from the culture of the game and for the health of the game. It goes out to billions of people around the world. "I can’t see how everyone isn’t going ‘hang on a minute’. I can’t see why fans aren’t saying ‘I’m not having that, it’s ridiculous’. "We used to stand for standards like that in this country. "It’s a massive debate and I’m pleased at last - I’ve been speaking to the powers that be for two years about it - they said on Match of the Day they’ve got to start looking at retrospective action. "It’s gone too far. I told them two years ago and I told them in the summer. The Premier League is an amazing product and brand that goes out to billions of people. How many children are watching? "My son plays and I can assure you there are kids diving all over the place? That cannot be right. "If you caught your kid cheating in a maths test what would you say? You'd go mental, absolutely mental. "Seemingly in football it’s okay if little Johnny dives, it’s clever. Is it clever to cheat then? I don’t think so. "It’s a fantastic game. It’s in great shape with the styles of games, the great managers and great ability you see. So why not polish it up a bit more and say ‘let’s get rid of this nonsense’." While Pochettino accepts English football has been influenced by Latin players in terms of simulation, he himself was a victim at the 2002 World Cup when Michael Owen went down easily to earn a penalty which David Beckham netted, helping send Argentina home. Dyche acknowledges that it has spread down the leagues and into non league and junior football: "There are fans out there who must be tired of seeing it. I’m tired of how it’s crept into our game to be accepted. It wasn’t accepted years ago, Klinsmann, Drogba when he first came here, we said we weren’t having it. "It happens in under-23 and under-21 football now. It shouldn’t be accepted. "Introduce retrospective bans and it will be gone. Look at the grappling at corners now. It’s gone. You give a couple of decisions and now you don’t see it. It’s gone already. "Retrospective bans for diving. Certain teams would have three or four players done immediately, from a warning in private to the manager up to a three-game ban. "It’s simple to officiate. You have a panel of experts and give out bans. Within six months the panel would be defunct because people wouldn’t be doing it anymore." Dyche has made his views known to the powers that be, but has had short shrift: "I saw an appetite when they said ‘good point, well made Sean’. That was the last comment I got, as they patted me on the head ‘oh the little ginger fella is back in the Premier League, bless him, see you later naive boy’. "I’m stunned it’s not been introduced. My son is 13 and I see it with my own eyes. We didn’t use to see it. "Kids copy the coloured football boots, the haircuts, the skills, they’re going to copy the way they act as well. "I’m not remotely suggesting my team are purer than pure. There’s been a couple this year and I’ve said ‘lads, not for us that’. "They’re not whiter than white. It’s not a moral high ground. This is for the good of the game. I just don’t think it’s acceptable." Cheating in other sports has been condemned, as he pointed out: "The blood capsule scandal in Rugby. There was mayhem after that. Rugby said ‘we are not having that’. "A similar version of that is a weekly event in football and we just go ‘hey ho’. ‘He was a bit clever there’. Clever? He’s not been clever, he’s cheating. "There is a distinct line between gamesmanship. If someone touches you in the box and you go down, that’s the way it is. Now they’re trying to be clever with no contact whatsoever. That’s a whole different ball game. "It’s got to a level now that it’s that theatrical that I’m surprised people don’t just start laughing. "Some of the unnatural movement it’s clever to get your body to do that. It’s like a dance move. "If someone has really got hurt they’re not rolling around and throwing their arms up." Dyche also expects his standards to be upheld down the age groups at Burnley: "I think we’ve got a culture here that I don’t need to tell them (youth teams). "Teach them, don’t tell them off. Explain it to them, show them the clip, we’re not doing that."